Justin Thomas wins inaugural CJ CupHolds off Leishman in a playoff for first victory of the season. The Nine Bridges Golf Club hosted Korea's first PGA Tour event. Photo by Branko Belan. Justin Thomas managed to weather a late challenge from Marc Leishman in the closing stages of the playoff to become the first player on the PGA Tour to win in Korea. 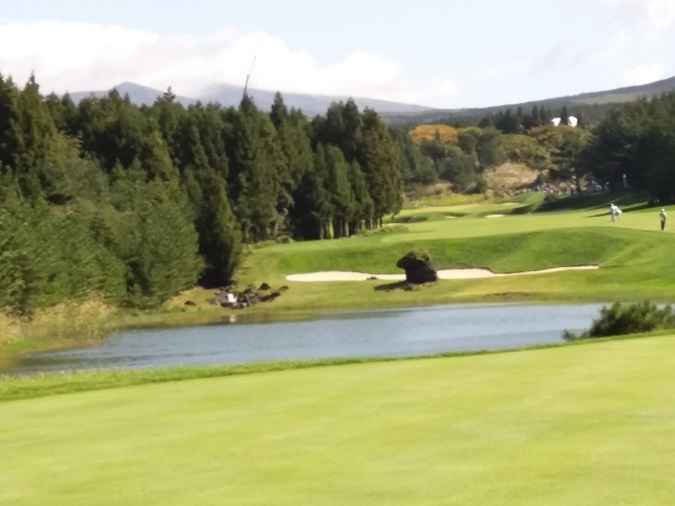 The CJ Cup, played at the Nine Bridges Golf Club, drew some of the biggest names on the tour. Also, the home country was well represented with sixteen Korean players in the field. Thomas was the early pacesetter. He shot a first round 63, good for nine under par and a three-shot lead after the first 18 holes on Thursday. The course played much tougher throughout the weekend as seen in the final round. During this stage, Thomas had arguably had the best round of the day even though he only managed to shoot an even-par 72 with a birdie on eighteen. This secured a sudden-death playoff against Leishman, who briefly held the lead in the late stages of the tournament. The par five 568 yard final hole proved to be the signature one on the course, as the American and the Australian made good on their shots at the end of regulation, while both managing to par out the first hole of the playoff. Things took a turn in Thomas’ favor in the second round of sudden death, as Leishman found the water with his second shot, while Thomas took advantage and placed himself well within range of finishing early. Thomas finished the second playoff hole with a birdie, while Leishman’s waterworks left him to settle for a bogey, giving Thomas his fifth win of the calendar year. The 24-year-old is coming off a season in which he won the FedEx Cup championship and with a solid start to the new season, he could figure prominently again as the tour goes into the fall portion of the schedule. South Korean golfer Whee Kim was the best finisher for the home contingent, ending in fourth place at seven under following a final round of 72. Overall, the course played very well and the conditions for a Sunday were as good as they possibly could have been, with sunshine and a crisp breeze in the air. This followed a stretch of rain and clouds on the island in the days leading up to the tournament. The course itself cracked the top 100 in the world for 2017, coming in at #41, and it looks as if the new stop on tour is primed for future success. There was a snag in the coverage of the playoff, as the Golf Channel, which was the carrier of the event, did not air the conclusion of the playoff due to technical difficulties. They later released an apology stating how sorry they were for the inconvenience to viewers around the world. The tour will now head to Shanghai, China for the World Golf Championships, to be played from Oct. 26 to the 29.